It’s a Skin Celebration this September and it’s time to get your Skin on the A-List and when your skin starts to talk to you it’s time to listen! Our Sorbet Beauty Editors have put together your morning and evening Beauty Regime. What’s your Mix Fix? Cleansing is performed to loosen and dissolve dirt, waste products, make-up and dead cells from the surface of the skin. Cleansing improves the skin’s capacity to regulate the normal sebaceous and pH balances. It removes make-up and dissolves and loosens debris easily. 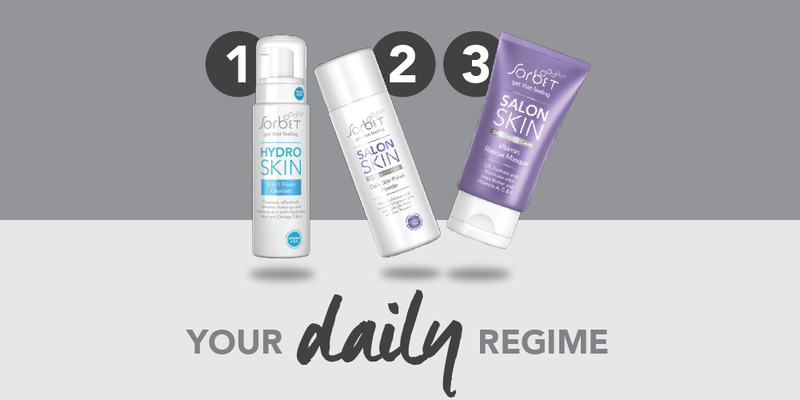 The Sorbet Hydro Skin 3 – in – 1 Foam Cleanser can be applied and worked in with light, circular movements to face, neck and décolleté. Apply in circular, quick, vigorous movements according to manufacturers’ instructions. It’s quite a stimulating action on the epidermis. Apply 1 – 3 times per week after toning – depending on the skin type. It is essential to use a mask regularly, at least X 1 – 2 per week after exfoliation. The skin must be thoroughly cleansed prior to the application of cleansing, refining, desquamating or stimulating masks. In some cases active serums can be used under a mask. Apply a thin layer onto the face, neck and décolleté. Leave for 15 minutes. Apply around the eyes only if instructions allow. Otherwise, use an eye mask. Wash off with warm water and sterile sponges. Some masks may be left on overnight.